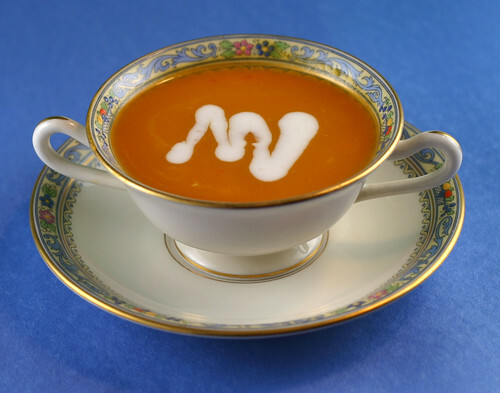 I always thought that Butternut Soup was so rich and flavorful that it must have a lot of cream in it and would probably be difficult to get right. Boy, was I wrong. This recipe is simple and has minimal ingredients with all of that amazing butternut squash flavor. The sage complements the squash beautifully. This recipe is from Oprah Magazine. Mary made a Butternut Squash Soup too, but Katy's recipe sounded better so that's what we're going with. In a large pot, heat olive oil over medium heat. Add onion and cook until translucent, 8-10 minutes. Add squash; cook 5 more minutes. Add chopped sage and broth’ bring to a boil, reduce heat to medium-low and cook until squash is very tender, about 30 minutes. With an immersion blender, puree soup until smooth (or puree in small batches in a food processor fitted with knife blade). Season to taste with salt and pepper. In a small pan, heat ½ inch vegetable oil until hot. Drop sage leaves in about 3 at a time and fry until just crisp; remove to a paper-towel-lined plate. Serve soup hot, garnished with 2 or 3 sage leaves per bowl. One of my favorites….if you made it , its gotta be good!! Both of those pictures are wonderful! Mary, I recognize that china! Beautiful! I love the sage with the squash. Great flavor contrast! I wish I had a bowl right now! I love anything with butternut, unfortunately they are still hard to find here. Love short list of ingredients. We have sage in the garden, but almost never use it. 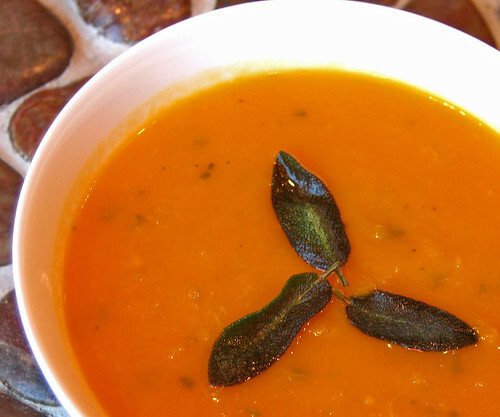 It’s such a strong flavor, I wouldn’t have thought to use sage in a butternut soup. It sounds like a bold, flavorful combo. And, almost as important, so pretty! Yumm… Looks good. The Pictures are great!! And I love squash it taste like candy and everbody loves soup so I have a feeling my family and I will be make this soon!! !